Our house has a few offbeat features: among them a fireplace set in the dining room, rather than in the sitting room. The arrangement dates from days when a New England winter evening meant kindling a fire, closing the pocket doors, and enjoying a cozy supper without heating the remaining rooms. Though most of the year we take weeknight meals in the kitchen, by January we're ready to set our places by the hearth. Our snow season repertoire - like yours we expect - emphasizes long-simmered soups, stews, and braises with plenty of aromatic winter vegetables. 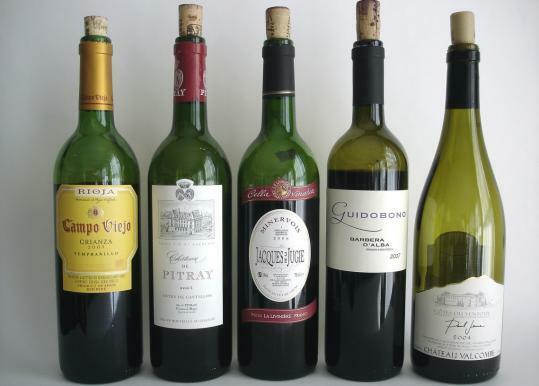 To pair with these, we look for value-priced red wines that bring a warmth of their own to the table. As regular readers know, the little wines that are the subject of this column tend to be from smaller, often family-run properties - wines that sometimes have offbeat features of their own. It's not unusual to encounter examples that seem a bit rustic, or where the balance isn't all one could wish for. No matter. Consumers prepared to overlook the occasional quirk will be amply compensated by a level of character and interest heavily marketed brands just can't deliver. Here's what we're sipping this month behind the pocket doors. Campo Viejo Rioja Crianza 2005. Simple, juicy red fruits profile; no edge maybe, but enviably good- natured. Authentic go-with-everything, please-everybody party red. Around $10. At the Wine and Cheese Cask, Somerville, 617-623-8656; Gary's Discount Liquors, Chestnut Hill, 617-323-1122; Butcher Boy Marketplace, North Andover, 978-688-1511. Château de Pitray Côtes de Castillon 2005. Snug, well-proportioned package with sturdy fruit, plenty of flavor and a good bit of Bordeaux character. A trifle raspy when uncorked, gurgling it into a pitcher brought it right around. Punches above its weight. Around $12. At Marty's Fine Wine, Newton, 617-332-1230; Vins Liquors, Natick, 508-653-1366; the Wine and Cheese Cask. Cella Vinaria "Jacques de la Jugie" Minervois 2006. An old favorite we were happy to revisit. Darkly plummy aromas and flavors; good solid fruit presence, freshness, and zip. Pour into tumblers, ladle out the turkey chili and throw another log on the fire. Around $8. At Esprit du Vin, Milton, 617-296-9463; Kappy's Liquors, Medford, 781-395-8888; River Valley Market, Northhampton, 413-584-2665. Guidobono Barbera d'Alba 2007. Pleasantly earthy aromas; fruit rather sweet at the core; sports some appetizing acidity. A bit more regional and varietal character would be welcome, but we're not complaining. Around $10. At Wollaston Wine and Spirits, Quincy, 617-479-4433; Wine Gallery, Brookline, 617-277-5522; Golden Goose Market, North End, 617-367-3198. Château Valcombe Côtes du Ventoux 2004. Dark, dark ruby-black hue; big flavor; trace of funk and dirt in the nose; some chewy texture and great ripe, round fruit. One amazing little overachiever, this. Around $12. At Vintages, Belmont, 617-484-4560; Seiyo Sushi and Fine Wine, South End, 617-447-2183; Upper Falls Liquors, Newton, 617-969-9200. Stephen Meuse can be reached at onwine@comcast.net.